When we got home Sunday, I walked in the door and audibly (well at least from what I could hear) moaned. My house is a complete and total disaster from all the projects I have going on (and all the housework I have neglected because of said projects) Last night, I groggily did some of it, but I have a ton more to do. One project I have finished is our dining room chairs. We got our dining room table on Craigslist a week or so ago. Last weekend, I went to some junk sales in town and picked up three chairs. I didn't care that they didn't match. I knew I was going to paint them white. All three chairs. Quite the steal at 12$ for the lot. Generally, I like to use actual paint and brush it on when doing furniture. This time though, I decided to use spray paint. The result was actually quite good. I'll have to see how they stand some beating. I first remove the seats from the two chairs that had padded seat cushions. That's super easy with a screw driver. I also pulled off some wood that was chipping off the chair in the middle. I have to admit my very least favorite part of any revamp is sanding. 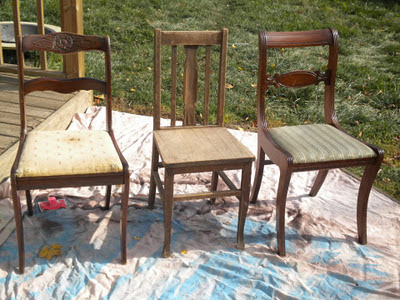 I probably could have gotten away with just priming, but these chairs were pretty beat up and needed some TLC. So I lightly sanded (by hand since my sander died in a literal ball of flames last weekend) all three chairs. 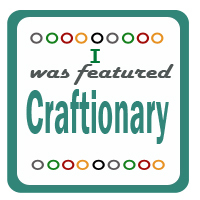 I then took a damp wash cloth and wiped them down. After they had dried, I took a clean dry rag to them to get any dust that remained. 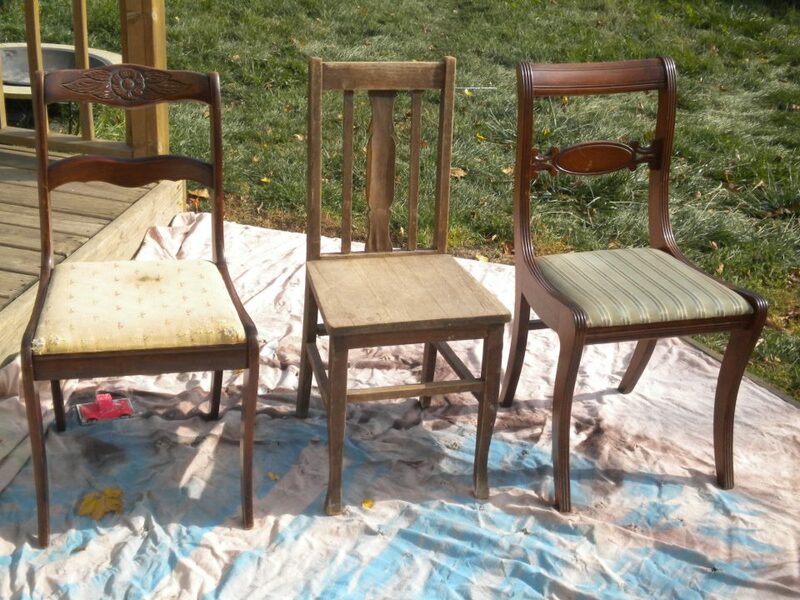 I decided to prime my chairs after reading some articles about how it makes spray paint more even (which I found to be true). I used Rustoleum primer, and it worked great. One can got two coats on two chairs and one coat on the other. I used Rustoleum paint with a satin finish (or semi-gloss). I found that the paint didn't go quite as far as the primer. 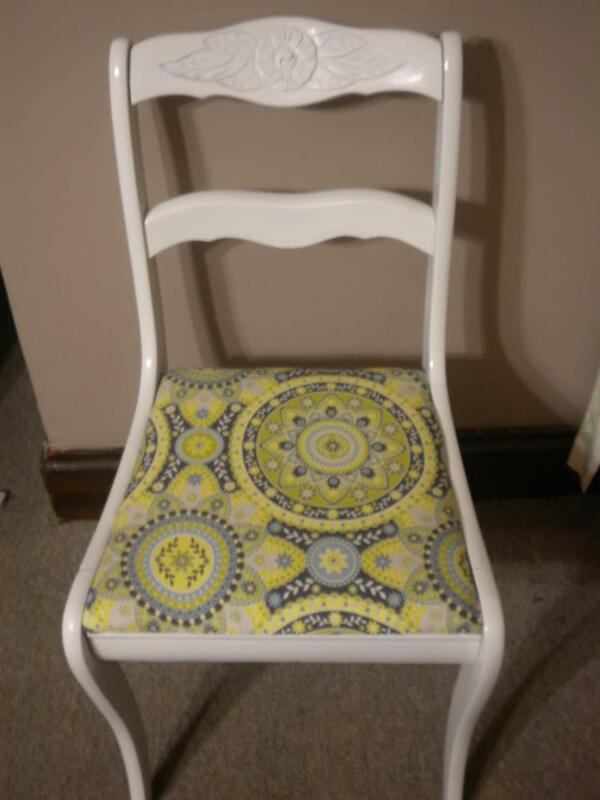 I ended up using two cans which gave each chair two to three coats of paint. As I've said before, there are two tricks to spray painting. 1) You need to shake hard and often and 2) You need to make slow, light, even, long coats. Make sure you follow the directions! Spray paint usually requires you to make subsequent coats within an hour or wait 24 hours before starting another coat. Since these chairs are going to see a ton of traffic, I also decided to do a clear top coat. I do have some spray polyurethane; however, polyurethane yellows and I was painting these chairs white. Instead I grabbed some gloss clear spray paint I had sitting around. One can (that was probably already 1/2 empty) was enough to give each chair a top coat. 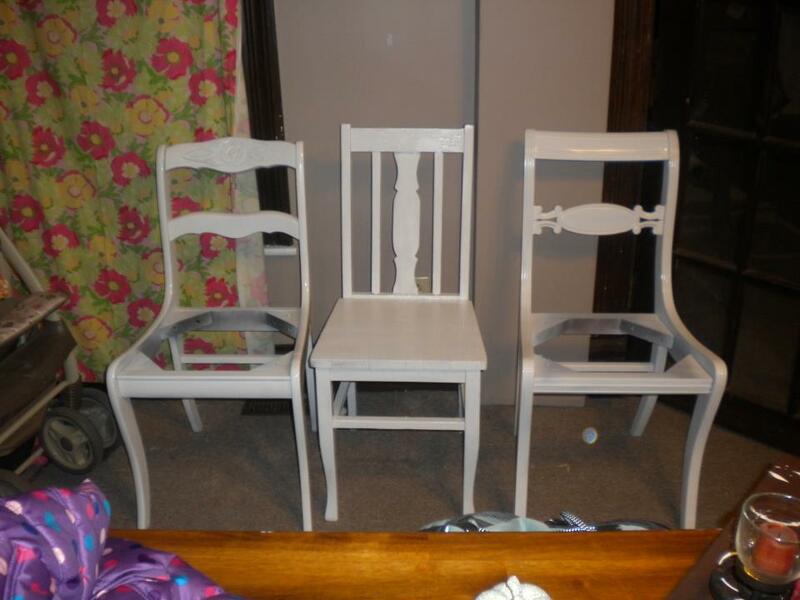 The three chairs with paint and top coats. I took the two chair pads I had set aside and decided to cover them. I didn't remove the old fabric. It was ugly but in good shape. I was going to order some heavy duty home dec fabric, but decided at the rate I pick home dec fabric, I probably should just pick some fabric from my stash. I used just a quilt cotton fabric called "Silent Cinema." It's not going to stand the test of time, but allows the chairs to be used now. I'm pretty happy with the way they turned out! We will need to find one or two more chairs, but right now, the three I've got are looking pretty good. I love chairs and you have 3 very pretty ones. I like the fabric you used. Don't you just love seeing an old thing come to life again! Really pretty! I have 2 rose back chairs waiting their turn to be transformed! New follower, hope you'll visit me too! Thanks! Wow, these look great. What a transformation! I love chair transformation and this is a good one, liking that funky pattern against the white! I love them. They turned out wonderful. 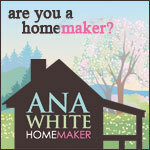 I'm hosting a GIVEAWAY on DIY Home Sweet Home. 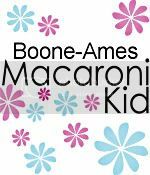 Would love you to check it out. very nice! And thanks for showing a pic of the three chairs side by side, I have been trying to convince my hubby to let me find "new" chairs for our kitchen but he can't get over the fact that they will all be different (and like yours, painted white) so now I can show him a pic!! Love what you did with the chairs. They are gorgeous. I just finished one myself and painted it cream. Thanks for sharing. These chairs turned out cute!! I found you vis Lindsey at Better After. 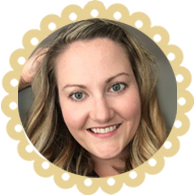 I'm a new blogger and now a new follower!